Your manuscript is a mess, or maybe you don’t know where to go with it, or maybe you doubt this is a story you can write, or maybe you’re just frustrated. For whatever reason, you are sorry you ever started the thing. You and your WIP need help. This workshop will send you to therapy. Step 1: Find a quiet spot where you can write–longhand or on screen–for a few uninterrupted minutes. Step 2: Use some kind of timer. Set it for 15 minutes. Step 3: You will free write everything that is bugging you about this MS, uninterrupted, for 15 minutes. Step 4: Start your timer and go. Step 5: Stop writing. Walk around or take a break for another 15 minutes, then settle back into your quiet writing spot. Step 6: You will free write everything that drew you to this story and why you wanted to write it. Step 7: Start your timer and go. Step 8: Read both free writes. Do you want to continue with this WIP? What is a Free Write? 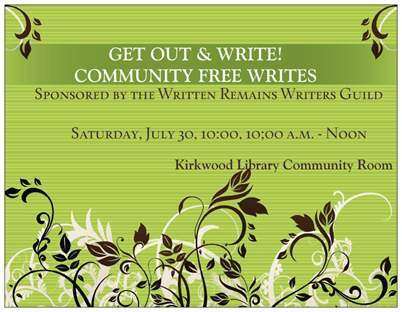 A Free Write is an informal gathering of writers who meet to practice their writing. Free writing can help you discover new story ideas, dissolve writer’s block, or move forward on a work in progress. Some Free Writes are guided, using prompts and round robin sharing of what was created during the session. Other Free Writers meet in a specified location, fire up their laptops, and work on individual projects in a quiet, supportive atmosphere. Some writing organizations hold regular Free Write sessions for their members and visitors. One group in my area, the Rehoboth Beach Writers Guild, posts prompts via a Facebook page. Both organized and informal groups hold Free Writes during intense writing times, such as November during NaNoWriMo. To host an unguided Free Write is simple: select a space (library meeting room, coffee shop), invite people, and show up to write. A guided Free Write requires a little more work. It needs a plan, a program, and a facilitator. A Free Write plan includes the purpose of the session and how that will be demonstrated. Will the Free Write focus on one area of writing, such as sensory details; story openings; colors; encounters both hostile and friendly? Will there be a theme, with specific prompts from broad categories such as holidays, childhood, marriage? A Free Write’s program is like a meeting agenda: the order of business and length of each prompt session. For a guided Free Write, the program should include time to write but also time to read aloud if the group includes sharing as part of the experience. A Free Write facilitator is the person who runs the meeting: she states the rules, offers the prompts, watches the clock, and guides the sharing sessions. Memorial Day was used as a Free Write theme a year ago, at a local Get Out & Write Free Write. Click here for a sampling of what writers created from the “poppies” prompt. Free Writes can be a boon to a writer’s creativity as well as an introduction to other writers. Try one!